Choose Your Wording: 1.5 mil 86500 Yellow 3(75mm)x1000ftCautionCautionCaution""1.5mil86600Red3"(75mm)x1000ftDangerDangerDanger""2.0mil86501Yellow3"(75mm)x1000ftCautionCautionCaution(+$3.50)""3.0mil86503Yellow3"(75mm)x1000ftCautionCautionCaution(+$8.50)"
Barricade tapes are an economical way to mark, identify and protect workers and visitors from job site dangers. These products offer a long lasting marking solution for off-limit areas or crowd control. A variety of mil thicknesses are offered so the correct product may be matched with the projects duration and other variables such as weather exposure. 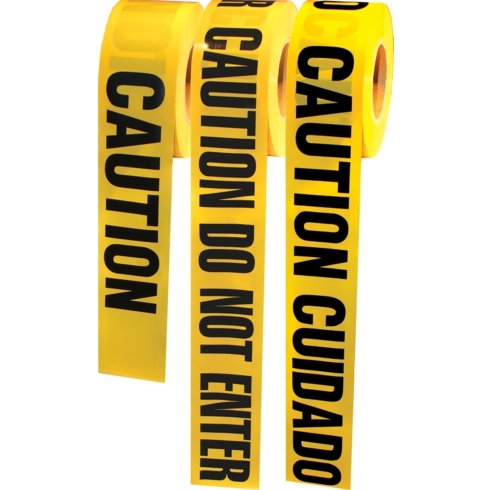 Common Uses for Barricade Tape A marking solution indoors and outdoors for off-limits areas, physical hazards, property lines, raising awareness of danger, cordon pedestrian traffic, accidents, crime scenes, construction sites, and more. •	Other Legends Available – The following are available on a special order basis.